Why is this information important? Because just using the common name can bring on much confusion; and inaccurate information. There is some confusion over the Canadian Hemlock Tree and Tsuga essential oil. This is NOT the poison hemlock which is Conium maculatum. The famous hemlock poison you hear about is from the Conium species, not Tsuga; Conium contains toxic alkaloids and is not a source of essential oils. So, it is always a good idea to purchase your essential oils by Common Name and Genus Species so you know what you are getting! Other common names for the Canadian Hemlock Tree include: Spruce Hemlock, Spruce Pine, New England Hemlock, White Hemlock and Hemlock Spruce. What Part of the Canadian Hemlock Tree is Used? Steam distilled from the leaves and twigs – Idaho, Canada. What are the Canadian Hemlock Tree Properties? tonic, nervine, balance, emotional, great to use with yoga and meditation. What is the Aromatic Affect on the Mind? The herbaceous aroma is uplifting yet grounding, uplifting and opening of emotions. What is the Spiritual Influence? The energy of this oil assists with the divine and mother earth connection; and therefore is good for mediation (and yoga). As with most tree oils, it is rounding oil which means it brings calming and solidity to the spirit. Topical: Dilute 1 drop with 1 drop of V-6 or olive oil and apply to desired area as needed apply to chakras/vitaflex points. Diffuse up to 30 minutes 3 times daily. Caution: Keep out of reach of children. For external use only. Keep away from eyes and mucous membranes. If you are pregnant, nursing, taking medication, or have a medical condition, consult a health professional prior to use. Flammable. Do not use near fire, flame, heat or sparks. Do not store above room temperature. 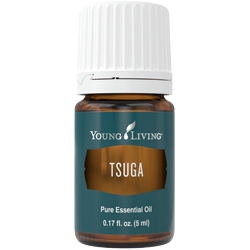 Tsuga has skin-cleansing properties and is spiritually uplifting. Its fresh aroma is the result of steam- distilling the needles and twigs of the conifer tree.